1. How to turn off highlighting of today's date? 2. How to display calendar for a specific month or complete year? 3. How to print week number below each week column? 4. 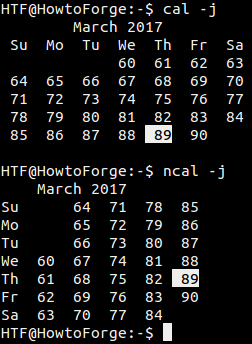 How to display previous, current and next month in one go? 5. How to add a specified number of months before or after the current one in output? 6. How to run cal in ncal mode and vice-versa? 7. How to change start day of week? 8. How to display a particular month and year? 9. 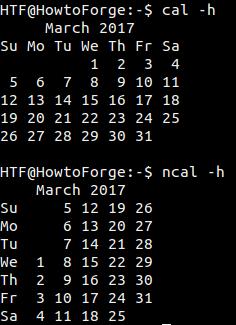 How to display date of Easter? 10. 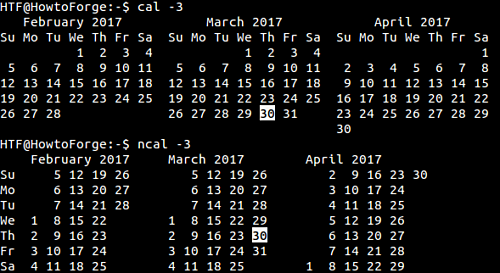 How to display Julian calendar and Julian days? 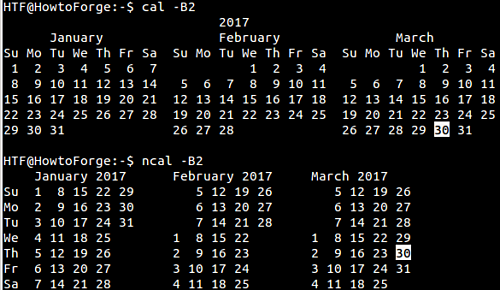 If you want to quickly view a calendar on terminal in Linux, then cal is the command line tool that you should be using. By default the command displays the current month in output. There's another similar utility, dubbed ncal. It differs from cal in the sense that it offers an alternative layout, more options, and the date of Easter. In this article, we will discuss both these tools in detail, giving you an idea about their capabilities and feature-set. 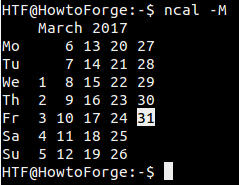 While the cal/ncal commands display the current month by default, you can use the -m command line option in order to have a specific month displayed. 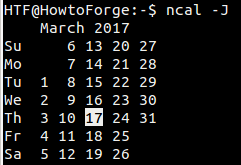 This options requires a numeric value (1-12) that represents the month you want the command to display. 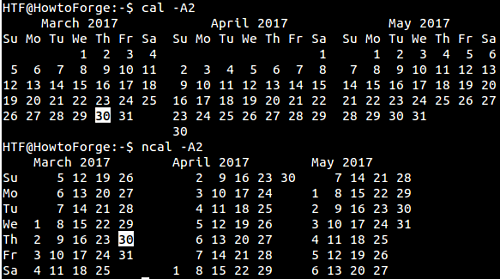 Similarly, the calendar for a complete year can be displayed using the -y command line option. 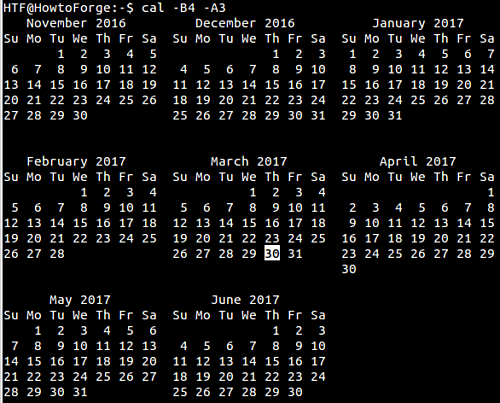 The cal/ncal commands also displays the previous, current and next month surrounding today. For this, you need to pass the -3 command line option. 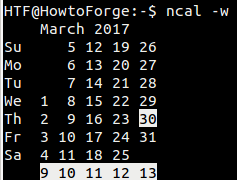 If you want, you can make the cal/ncal display a specific number of months after the current month. 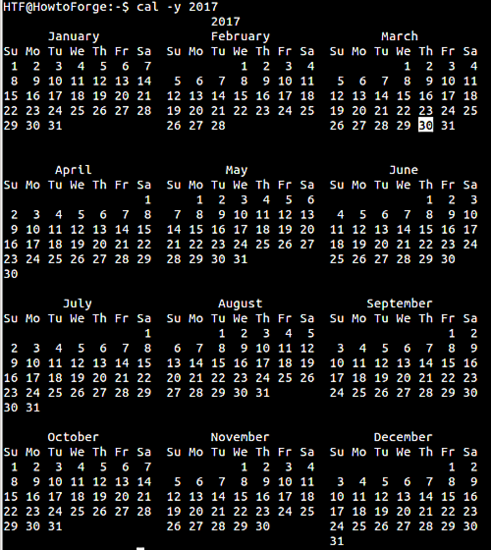 This can be done using the -A command line option which requires the number of additional months you want to display. 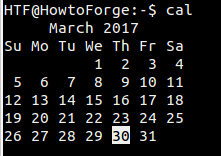 Similarly, in case you want to display a specific number of months preceding the current month, use the -B command line option. While both cal and ncal have separate output layouts, you can actually force them to switch to the other's layout. 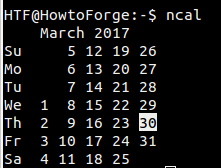 To make cal switch to ncal's layout, use the -N command line option. Similarly, the -C option forces ncal to switch to cal's output mode. Note: The -b option for ncal also does the same (the man page says use this option when you want to have oldstyle format for ncal output). Both cal and ncal assume Sunday as the first day of the week. This is by default. However, if you want, you can change this, and have weeks begin with Monday instead. This can be done using the -M option (works only for ncal though). 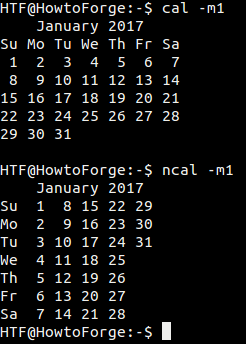 Suppose you want the cal/ncal commands to display a month/year other than the current month/year. This you can do by using the -d command line option. This option requires year and month to passed in yyyy-mm format. The -o and -e command line options are what you need here. While the former tells the ncal command to display the date of orthodox Easter (for Greek and Russian Orthodox Churches), the latter asks ncal to display date of Easter for western churches. 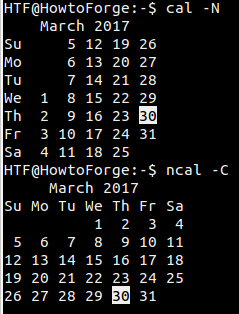 To display Julian calendar using ncal, use the -J command line option. 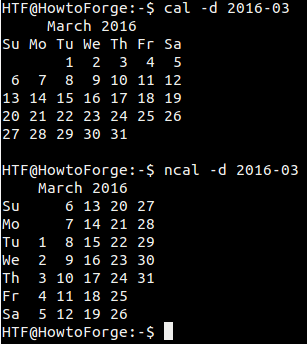 Both cal and ncal are pretty useful if your work involves using calendars on the command line. The ncal command is slightly better than cal when it comes to features (or command line options). Do try out all the examples mentioned here, and when in doubt, refer to the commands' man page. Great tutorials. Please, go on. Thanks for your work.